Ask fellow campers about "Canyon de Chelly National Monument, Cottonwood Campground" and nearby attractions. Question: Is this campground "first come, first served" or is there a reservation system? Thanks in advance for any help you might provide. Answer: Yes it is a "first come, first served" campground. They did let us drive around to look at the different sites and choose one. Dry camping with dump station, Mostly shaded, Somewhat tight navigation, Very quiet, Good Dish Sat from my site, AT&T data fluctuated from 2 bars LTE to 4 bars 4G. I was here to visit the Canyon de Chelly National Monument which is right next door. There were very few campers here during my stay. Generator hours are from 6:00 am to 8:30 pm. We camped at Canyon de Chelly National Monument, Cottonwood Campground in a Motorhome. Very nice campground! No hookups, shady sites. It was very hot and three dogs made themselves at home under my RV to keep cool. I reported it to the office but was told that they belong to someone who lives in the area and just 'hang out' in the campground during the day. They were nice dogs and I gave them water. Drove the park road in the cooler morning and it was really beautiful. Roads are excellent and the viewpoints have ample hiking. There was one guy surreptitiously hawking souvenirs at one of the viewpoints which is not allowed, according to signs. We camped at Canyon de Chelly National Monument, Cottonwood Campground in a Motorhome. Tip: Do not take CR 15 as a 'shortcut'. It is comprised of slabs that are very rough the whole length of the road. Centrally located for exploring Canyon de Chelly NP. No fees are charged to enter this National park but a $14 / night in cash is charged to camp. We walked the campground every evening on the paved roads, but if you venture into the grass there are "stickers". Sites range from full shade to full sun. No reservation system, but continual turn over of visitors allowed choice of site! 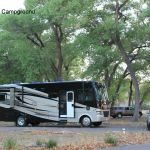 We camped at Canyon de Chelly National Monument, Cottonwood Campground in a Motorhome. Short drive to Chinle for groceries and restaurants. This is a first come, first served basic campground. There are no hookups but there is water available and a dump station. The sites were level and there were lots of choices between shade/no shade/access to DirecTV signal. The great thing about this campground is its proximity to the entrance to Canyon de Chelly. A number of the other reviews talked about vendors and stray dogs wandering around. We saw none of this and, in fact, were pleasantly surprised at how nice the campground was considering it is basic boondocking. Regarding the water, the faucet at the dump station was out of order when we were there, but there are faucets located in the center of each loop. We had one directly behind our site (#90 in loop 3). A 30' hose did the trick. We camped at Canyon de Chelly National Monument, Cottonwood Campground in a Motorhome. If you want to tour the canyon, you must go in with a Native guide. We were quite satisfied with our tour company, Canyon de Chelly Tours. Our Navajo guide has lived in the Canyon her whole life and was quite knowledgeable about the flora, fauna and archaeological sites. She was quite open to talking about her culture and how it has evolved over the centuries. She also showed us some great photo points and made sure we got some wonderful shots. The park roads were asphalt and were tight for a larger RV (in our case a 36' DP motorhome). The campground itself is somewhat difficult to find, especially if you arrive after dark, as it requires several turns onto small roads. Our site was just dirt and very small surface brush (typical in the southwest), but we later found small, very sharp spikes in the dirt. A word of warning to dog owners, or people who like to walk around bare foot, every time we let our 3 golden retrievers out into our fenced in area, they would come in limping, and we would have to inspect their paws and pull out the spikes. This campground has no water, electricity, sewer, cable or WiFi, and there are no local OTA TV stations. Verizon cell signal was 3 out of 5 bars. There were restrooms (don't know about showers), but since we don't use these facilities, so we can't render an opinion. There was no road noise what-so-ever. The price was reasonable for no services. We can't comment on the staff, as it is unmanned and self-register during the winter months. We probably wouldn't stay here again, but I don't know how many other options there are in the area. If you need water while there, you can go back into town, and behind the reservation headquarters you can buy water for a penny a gallon. You'll see a hose hanging from a scaffold which has no end on it, but when you pay and tell them you need a regular hose hookup, they will bring out a standard hose. We camped at Canyon de Chelly National Monument, Cottonwood Campground in a Motorhome. A guided tour of Canyon de Chelly is a must. The drive around the top rim was also great, but at every stopping point be prepared to be inundated with people selling stuff. The same thing is you walk around town. Cash only. No credit cards or checks. Easy access to Canyon de Chelly. Lovely location. Signage to find campground poor. Follow signs for Thunderbird Lodge. Turn just before Thunderbird Lodge. We camped in a 36' motor home. No OTA tv. Good AT&T, fair Verizon. We camped at Canyon de Chelly National Monument, Cottonwood Campground in a Motorhome. We loved this park. It was convenient to touring Canyon de Chelly. It was so quiet at night we could hear the owls. The sites were paved, level with lots of separation. The park was very empty this time of year. Given the proximity to the park, we thought it was a great value. Our Hopi guide picked us up at out site so we did not have to drive to the business location. We camped at Canyon de Chelly National Monument, Cottonwood Campground in a Motorhome. There are many different types of tours are available right at the park: Jeep, Suburban, horseback, and hiking. Nearby is Hubble Trading Post (30 miles south of the park). There are no hookups but the trade off is that this location is less expensive and quiet. I liked it here, it was safe and quiet. Cash only. Lots of burrs on the ground and it would be nice if they cut back and raked the weeds. Good value. Water and dump station available We camped at Canyon de Chelly National Monument, Cottonwood Campground in a Fifth Wheel. There is an office near the kiosk for change. This was a very nice spot to stay to visit Canyon de Chelly. This campground is on the Navajo reservation and offers NO hookups. Cash only. It is shaded and well laid out. Some bathrooms and water are turned off during winter so check your dates and make sure to have your water tank full. We were there at the end of March and some were still closed. Actually it snowed lightly on March 31st. Many sites are short, but we were able to find spot for our 40' motorhome. We camped at Canyon de Chelly National Monument, Cottonwood Campground in a Motorhome. Get a jeep tour of Canyon de Chelly--awesome! Navajo guides are wonderful. We chose Beauty Way Jeep Tours and were very pleased! This is an attractive campground with paved, level sites with lots of separation between most of them. Some sites have shade, some are open. Didn't use the restrooms so can't comment. What I DIDN'T like was being ripped off for $14 for no hookups in a "National" park that does not honor the Senior Pass. We've been to many NFS and NP/NM sites that are just as nice for a lot less. Also don't even think about walking off the pavement. The entire place is covered with stickers. The poor dog got a foot full of them after three steps and even I got a couple in my sandals. All that said, this is the only camping in the area that I know of except a place on the park road that looked like a toxic waste dump. I'd try to plan better next time and allow enough time to go to a NFS site or an RV park where you at least get hookups for your money. We camped at Canyon de Chelly National Monument, Cottonwood Campground in a Truck Camper. Canyon de Chelly is spectacular. A "grand" canyon without having to fight mobs of people. This is dry camping operated by the Navajo Nation and not by the National Park Service. They do not honor NPS Golden Eagle/Age Passports. Paved roads and sites. Not overly secure as witnessed by the many warning signs to store valuables out of sight and to lock your vehicle, but had no problems the day I was here. Similar signs are posted through out Canyon de Chelly National Park, which is directly connected. We camped at Canyon de Chelly National Monument, Cottonwood Campground in a Motorhome. Canyon de Chelly NM is directly connected to this campground and is worth visiting. The NM is connected via several short paved spurs off a road which runs through the Navajo Nation. Just my thoughts but I did not feel secure in this NM since the turnouts were populated with locals whom I did not trust. All were with 4X4 vehicles and all were backed into the parking spaces. NPS signs telling visitors to place all valuables out of sight and to lock your vehicle, was not reassuring to me. A simple, pleasant place close to the Canyon de Chelly views, this clean, neat campground is a great value. Be careful approaching, as there is no clear signage and our GPS sent us on a 3 mile goose chase; take the turn toward Thunderbird lodge. The park is mostly shaded by tall trees with paved access roads and sites, all quite level. We had one of the pull-thru sites which was very adequate for our 37' MH and toad (disconnected). There were no hookups, but the dump station was convenient and clean. There was no WiFi, with Verizon we didn't get any data service in the area, and connectivity was spotty at best even at local restaurants that offered WiFi. We didn't use the bathrooms, and there was no laundry available. Even with the limited amenities, we thought this was a good value at such a low price. We camped at Canyon de Chelly National Monument, Cottonwood Campground in a Motorhome. We changed our route when we realized we were so near and stopped here today. Our site, 31 faces out on an unopened Section 3. It's quiet. Generators can be used, as needed, except from 6:00AM and 8:30PM, Quiet Time. The campground has NO water, for some reason. April 1 is the official opening day, but it didn't happen as we would like. Luckily we have enough water for three days. Leaves are all over the place, but it's quiet. Goat's head thorns abound and stick on the soles of some sandals. Be aware! The Canyon is magnificent! We camped at Canyon de Chelly National Monument, Cottonwood Campground in a Motorhome. This is the campground to stay for visiting Canyon de Chelly. It has a very pleasant feel and seems to be well kept up. The sites are nicely spaced. There is a dump station and water fill. We had reasonably good Verizon voice and data (3G) on extended network. If you want satellite, you will need to choose your site carefully as there are a number of cottonwood trees. There are a number of signs warning about protecting your valuables from theft, but we did not have any problem. There are also signs stating no vendors, but we did have a couple of folks come by and try to sell us items. When we declined to purchase, they readily moved on. We did hear some barking dogs in the distance but it was not a problem. The campground was relatively quiet at night. We camped at Canyon de Chelly National Monument, Cottonwood Campground in a Motorhome. A tour into the Canyon is a must if you are going to really experience Canyon de Chelly. Just gazing from the rim does not do it justice. There is a fairly good Basha's food store in Chinle. 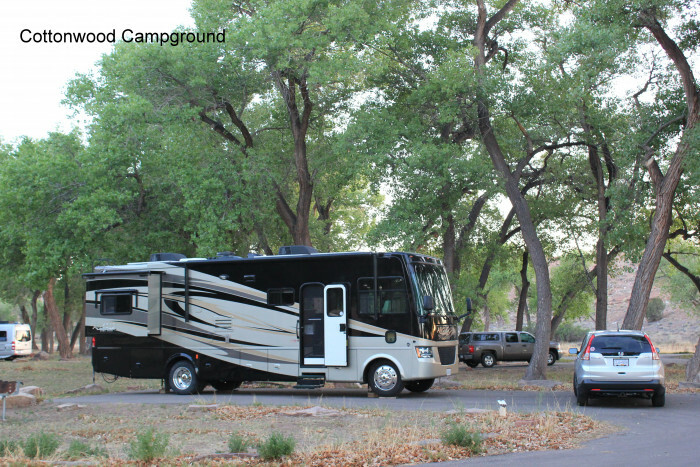 This is a no-hookup campground with paved sites, and within walking distance of the museum/visitor's center. The sites are located among large cottonwood trees, so most are well-shaded, and it's cooler here than you would expect because of the shade. If you take one of the tours through the canyon, you will be picked up in the campground and returned to your campsite. I would definitely stay here again. We camped at Canyon de Chelly National Monument, Cottonwood Campground in a Motorhome. I highly recommend one of the jeep tours through the canyon. You'll see the ruins and petroglyphs up close that you would otherwise see only from a great distance along the rim drives. Canyon de Chelly NM is directly connected to this campground and is worth visiting. The NM is connected via several short paved spurs off a road which runs through the Navajo Nation. Just my thoughts but I did not feel secure in this NM since the turnouts were populated with locals whom I did not trust. All were with 4X4 vehicles and all were backed into the parking spaces. NPS signs telling visitors to place all valuables out of sight and to lock your vehicle, was not reassuring to me. Both the north and the south rim roads have a number of overlooks so you can see down into the canyon. There are Navajo concessionaires who conduct half-day and full-day jeep tours and horse tours into the canyon. 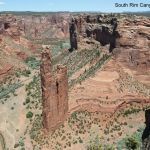 You must book a tour to go into Canyon de Chelly but you can drive the rim and stop at several lookout points for free. 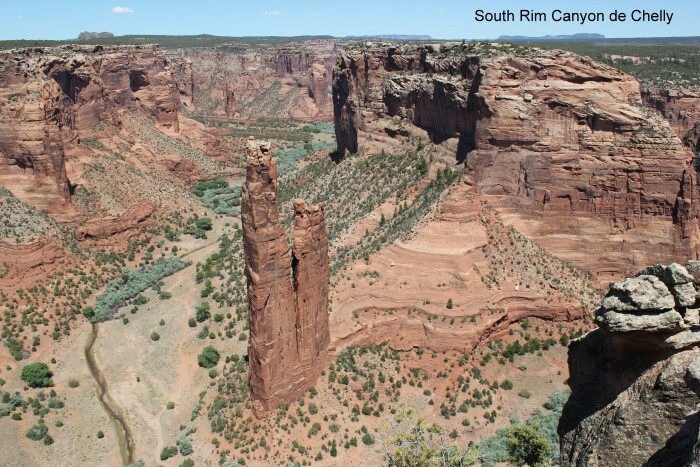 Are you affiliated with Canyon de Chelly National Monument, Cottonwood Campground ?